For more than 15 years, Amy has provided organizational management and strategic facilitation for environmental sustainability organizations and multinational corporations from various industry sectors using an integrative approach to synthesizing ideas, priorities, partners and projects. She spent 14 years as an Executive Vice President and Environmental Sustainability Strategist at Navista, Inc., The Public Affairs Group, where she provided strategic counsel, organizational management, planning, support and membership development, and served as the Director of the Global Environmental Management Initiative (GEMI). Cindy Jones-Nyland has a degree in marketing from Washburn University and a Master’s of Business Administration from the University of Texas at Arlington. Drawing from her vast experience in digital engagement and technology, she directs Heifer’s global branding, marketing and fundraising efforts. She has previously worked with Lifeblue Media and Susan G. Komen For the Cure as well as Oracle, MetaSolv Software and SBC. Previously as the Chief Marketing Officer at Heifer, Cindy led the marketing, education and fundraising of the organization. That included oversight of a global team responsible for donor engagement, communications, digital integration, media relations, events, community outreach, education, corporate partnerships, foundation relations and philanthropy. David is an experienced Director of Digital Sales & Marketing. His expertise includes management of sales teams and operations staff along with monetizing non-traditional revenue models. David has 19 years of experience from Washington City Paper, having served as Advertising Sales Director for his last five years. Prior to joining Washington Business Journal in 2015, he held Director of Digital Sales positions at CL, Inc. and SouthComm Digital. David graduated from Ohio State University with a Bachelor’s of Science in Business Administration. Gina is part of the corporate citizenship team in the United States at Accenture. She specifically works on employee engagement through volunteering and giving. Her specific duties include working with their locations on how they incorporate Skills to Succeed and Environmental Stewardship into their Corporate Citizenship strategies. She also helps shape and execute local granting. Gina has been with Accenture since 2000, having served as a Consultant and an HR prior to her Corporate Citizenship position. Jeni Oppenheimer has been working in the CSR & philanthropic space for over seven years and has a passion for social businesses that empower people around the globe. Currently, she is completing a one year global MBA at Hult in London, and serves as a Strategic Advisor to UKPR, the leading independent developer and operator of smart, flexible power generation in the UK. Prior to moving to the UK, Ms. Oppenheimer served as a Director on the Partner Solutions team at Global Impact where she worked with Fortune 500 companies on developing CSR strategies and international non-profits on fundraising diversification planning and board development. She has also worked with Enablis Entrepreneurial Network in South Africa, where she ran the international mentorship program, connecting entrepreneurs globally. Ms. Oppenheimer has worked in the United States, Tanzania, Zambia, Bangladesh, and the United Kingdom and currently serves on the board of Mary’s Place, an NGO that empowers homeless women, children and families to reclaim their lives. Mr. Octavio A. Hinojosa Mier has been an Executive Director of The National Hispanic Corporate Council since 2013. He joined to NHCC with more than nine years of nonprofit executive leadership and corporate development experience. He provides day-to-day leadership, vision, and strategic direction in growing the organization’s membership within Fortune 1000 corporations, as well as strengthens the organization’s initiatives in the area of best corporate practices as it relates to the growing importance of the U.S. Hispanic market. He also works closely with the Southern Methodist University (SMU) Cox School of Business and their James M. Collins Executive Education Center in promoting NHCC’s Corporate Executive Development Program (CEDP), a nationally-recognized, award winning, corporate executive development program for Hispanic managers and executives. Prior to joining NHCC, he gained national recognition for his role as the founding Executive Director of the Congressional Hispanic Leadership Institute (CHLI), as well as other nonprofit organizations. He was recognized by King Juan Carlos of Spain with the Order of Civil Merit for his leadership in promoting stronger relations between the United States and Spain. He is a graduate of the Maxwell School of Syracuse University (MPA) and the University of Kansas (BA). Abigail Kim is a Senior Associate at ideas42, a nonprofit design firm that uses behavioral science to improve social impact initiatives. In previous positions at International Crisis Group, the Management Center and IRD, Abigail researched issues related to security and humanitarian aid in East Asia, launched training programs that boost nonprofit capacity, and built diverse partnerships in Latin America and the Middle East. Abigail holds an MBA from the University of Chicago Booth School of Business and a BA in International Relations from Johns Hopkins University in Baltimore, Maryland. She currently lives in New York. Although her kitchen is somehow smaller than her closet, she is learning to make her grandmother’s recipes with great optimism and occasional success. An experienced business and non-profit leader, Teri’s passion is strengthening organizations through building sound strategy, creating efficiencies and cultivating the talent and relationships that help the organization achieve its goals and create impact in the world. Prior to joining Points of Light, Teri served as Manager of Corporate Responsibility for Hilton Worldwide for a little over three years. During her time there she developed a Donor-Advised Fund for Disaster and created the CR strategy for disaster response and philanthropic giving as well as directed and inspired Community Committees in 17 global corporate locations – Including Hilton Worldwide’s 4,000 global properties and the communities they serve. Her personal philosophy is that great leaders live as an example of authenticity, never stop seeking self-improvement and inspire greatness from their teams by empowering individuals and igniting passion. 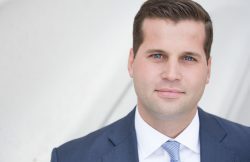 Justin Quaglia is a Vice President in High Yield Bond Trading at Oaktree Capital Management in Los Angeles, CA. Justin works with a team of investment professionals who oversee $20bn of high yield bond assets. Prior to joining Oaktree, Justin spent five years in Leveraged Finance Sales for Goldman Sachs & Co. in New York City focused on the structuring, marketing, syndication, and trading of high yield and distressed debt in the global capital markets. His role allowed him to analyze and transact in credit products and derivatives with large institutional investors and hedge fund portfolio managers. Justin graduated from James Madison University in 2011 with a B.B.A. in Finance and Economics and is actively involved with the University. He serves as the Alumni Coordinator for College of Business Experiential Learning Program, Co-Coordinator of the Seeking Achievement Mentor Program, and is the Chairman of the Madison Investment Fund Board of Advisors. Justin currently resides in Santa Monica, CA.